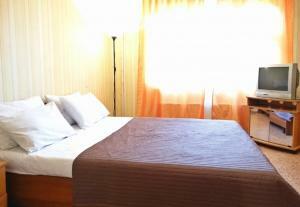 A-HOTEL.com - Luxury and cheap accommodation in Sharapovo, Russia. Prices and hotel, apartment booking in Sharapovo and surrounding. This indicative offer was derived from the most recently booked accommodation in Sharapovo and sort by the price, from cheapest Sharapovo accommodation to the most expensive hotels. To select accommodation by your preferences we recommend to choose from 1 accommodation offers in Sharapovo in total. By entering the dates of your overnight stay in Sharapovo and using the filter tools you can sort the best possible accommodation for you. The entered dates of your stay are crucial for the most accurate offer as it derives all the online information on pricing and availability of Sharapovo accommodation. Then you can book the selected Sharapovo lodging (hotels, apartments etc.) immediately. A restaurant, bar and 24-hour reception are all offered by this modern hotel. It is located in the town of Chekhov in the heart of the Moscow Oblast region. Featuring river views, Chekhov Apartment is set in Chekhov, around 1.2 km from Vityaz Hockey Centre. Located in Chekhov, within 600 metres of Vityaz Hockey Centre, Апартаменты на Московской is an accommodation offering city views. This property offers access to free WiFi. Located in Chekhov, Every day Holiday offers accommodation with a flat-screen TV. Free WiFi is offered. Situated in Chekhov, 1.2 km from Vityaz Hockey Centre, Cosy Apartment on Mira 8 provides a living room with a flat-screen TV, and free WiFi. Featuring ski-to-door access, garden and views of garden, SWEET DREAMS Inn is located in Chekhov, 1.4 km from Vityaz Hockey Centre. Offering free WiFi and garden views, Apartment First is an accommodation situated in Chekhov. Housed in a building dating from 1998, this apartment is 2. Domik v derevne is set in Manushkino and offers free bikes. The property has garden views and is 44 km from Podolsk. Boasting garden views, Forest Club Lyutoretskoye provides accommodation with ski-to-door access and a terrace, around 8 km from Vityaz Hockey Centre. Guests staying at this holiday home have access to free WiFi. Featuring a garden, Homely is a detached holiday home located in Chekhov. The property is 5 km from Vityaz Hockey Centre and free private parking is available.